Famous for its historic castles, fascinating and often bloody history, breathtaking scenery, lively cities, charming villages and the legendary Loch Ness monster, Scotland fills visitors with a sense of magic and delight. Get an introduction to this enchanting country. Start with a guided tour of a whiskey distillery north of Glasgow. Cruise along pretty islands on picturesque Loch Lomond and follow the “Road to the Isles” with its rolling hills, green woodlands and spectacular beaches. Visit the picturesque Isle of Skye and be on the lookout for the mysterious Loch Ness monster in the Highlands. Drive through Cairngorms National Park with its sub-arctic mountains and varied wildlife. Visit one of Scotland’s most famous battle sites, Culloden Moor, where Bonnie Prince Charles was defeated by Hanoverian forces in 1746. See where the game of golf began at St. Andrews and even hit a few balls at the St. Andrews Golf Practice Centre, if you like. Follow in the footsteps of royalty at Edinburgh Castle, which dates to the 12th century. It was once the residence of Scottish monarchs; today it is home to the Scottish Crown Jewels. 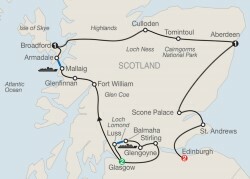 You’ll also board and tour the five decks of the Royal Yacht Britannia, home to Her Majesty the Queen and the Royal Family for more than 40 years, and end your Bonnie Scotland tour with dinner aboard this unique ship. Welcome to Glasgow! After checking into your hotel, the rest of the day is free for you to relax in Scotland’s largest city. This evening meet your Tour Director and traveling companions at a Welcome Dinner at your hotel. Beautiful Loch Lomond is your first destination today. A cruise on the lake past pretty islands brings you from Luss to the picturesque village of Balmaha. Enjoy a guided tour of a whisky distillery and learn the ancient art of converting barley, water and yeast into a heart-warming liquor. Next visit Stirling Castle, a great symbol of Scottish independence and the favored residence of Scotland’s kings and queens. Back in vibrant Glasgow, an orientation drive takes in the fine 12th-century cathedral, imposing university buildings and elegant Georgian squares built by wealthy tobacco barons. Follow dramatic mountain ranges and idyllic lochs as you proceed via the awe-inspiring expanse of Rannoch Moor, scenic Glen Coe, Fort William and the “Road to the Isles” to Glenfinnan. Take photographs of the viaduct featured in the Harry Potter films. At Mallaig board a ferry for the crossing to the Isle of Skye, the largest island of the Inner Hebrides and famous for its dramatic landscapes. Before dinner tonight, join an optional excursion to the spectacular Eilean Donan Castle, followed by a drink at a local pub. Return to the mainland this morning and trace the shores of Loch Ness on your way to the Culloden Visitor Centre, where you will hear the story of the crushing Hanoverian victory over Bonnie Prince Charlie’s Scottish clans. Enjoy more spectacular Highland scenery as you drive into Cairngorms National Park to stop at Tomintoul, the highest village in the Scottish Highlands. Continue to your overnight destination of Aberdeen. In contrast to the valleys and rolling hills of the past days, today you’ll travel along the shores of the North Sea and through rich, fertile and wide-open farmland to Perth for a special visit to Scone Palace, the stately home of the Earl and Countess of Mansfield. During your welcome over coffee and shortbread, hear about the crowning of Scottish kings, including Macbeth and Robert the Bruce. Then join your guide on a private tour of the Murray family home. You’ll have plenty of time to explore the palace grounds. Head next to St. Andrews, whose Royal and Ancient Golf Club, founded in 1754, has given us the rules of golf. You’ll have the opportunity to hit a few balls at the St. Andrews Golf Practice Centre. Cross the mighty Forth Road Bridge to Edinburgh, and don’t miss an optional Scottish evening with Highland dancers, bagpipers and the Ceremony of the Haggis. Morning city sightseeing with a Local Guide introduces you to the 200-year-old “New Town” and the famous scientists, inventors and novelists who lived in Edinburgh. Visit Edinburgh Castle in the “Old Town” and admire Scotland’s Crown Jewels. The afternoon is free to enjoy the Scottish capital at your own pace. Later board the former Royal Yacht Britannia, once the perfect royal residence for glittering state visits and family holidays. Tour its five decks and see how the Royal Family and crew of 240 lived and worked on board. Dinner rounds off this exceptional evening. For departures from July 28 through August 18, tickets are included for tonight’s performance of the world-renowned Military Tattoo, a vast spectacle of Scottish pipe bands that takes place in an arena on the esplanade of Edinburgh Castle. Your Bonnie Scotland vacation ends with breakfast this morning. Call 855.645.2215 to Book Your Globus Bonnie Scotland Guided Vacation Today! Prices based on availability, per person double occupancy and are subject to change without notice. Includes accommodations; some meals; on-tour motorcoach transportation; guided sightseeing; admission fees to attractions; hotel baggage handling; and all taxes and service charges. A $250 non-refundable, non-transferable, per person, per vacation deposit is required to reserve space for you, with some limited exceptions. Payment of the deposit indicates you have read and accepted these Terms & Conditions. Your booking is not confirmed until the deposit is processed by Globus and you receive a confirmation invoice. Final payment for your vacation is due 45 days prior to commencement of services, with some limited exceptions. Within the final payment date, payment in full is required at time of booking to reserve space. Reservations (land, cruise, and air) are canceled if final payment is not received by the due date; cancellation penalties apply, as noted below. See full Terms and Conditions. Great Vacation Destinations, Inc., doing business as Bluegreen Travel Services, is located at 4960 Conference Way North Suite 100, Boca Raton, FL 33431. Great Vacation Destinations is an Iowa Seller of Travel No. 688, Washington Seller of Travel, Florida Airlines Reporting Corporation (ARC) registration No. 15-72225-4, California Seller of travel registration No. 2068362 (Registration as a Seller of Travel does not constitute approval by the State of California). Void where prohibited by law and where registration and/or licensing requirements have not been met. In the event of a conflict between Globus’ Details of Participation and Great Vacation Destination’s Details of Participation, Globus’ Details of Participation will govern.